Consequent to my post Categorizing the Russia Debate and the lively debate it spawned, it occurred to me that much of Russia’s tortured and intriguing history could be rationalized as a self-reinforcing loop within a belief matrix. This can even be extended further to many other societies – I will also have similar posts up for a) Germany’s “Reich cycles”, b) America’s “liberty cycles” and c) the continuous “radical redefining of terms” that characterized Soviet history from 1914 to 1953. Here I will focus on outlining my theoretical framework (the concept of a belief matrix); then I will post about how it can be applied to different societies. 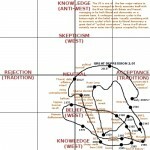 My assumption is that societies can be defined along two axes – their degree of ease with themselves, and with the West. By the latter, I mean specifically the Idea of the West: acceptance of the scientific method; rule of law; economic rationalism; and liberalism. An important semantic point is that these should not be conflated with “Western countries” (the US, the UK, France, etc); though they have, by most measures, internalized the Idea of the West to a far greater extent than most other cultures, they cannot ever reach unity with it because they are, at root, organic, human societies, whereas the Idea of the West is an absolute. 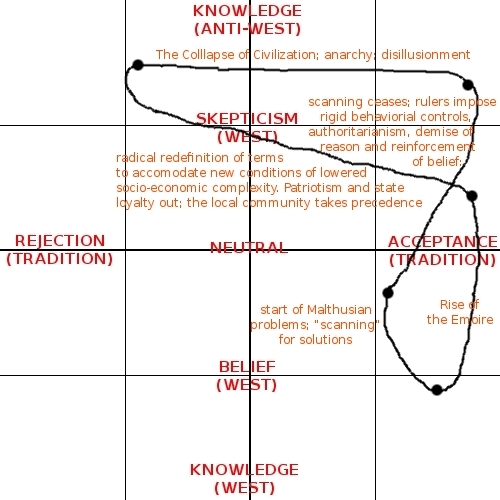 The other axis denotes how content a civilization is with its traditions. The default steady state is acceptive; though occasionally challenged by dissidents who reject tradition, society is characterized by a state of sobornost – a deep sense of spiritual harmony amongst classes, regions, races and sexes. Or as my definition of Russophilia goes, they understand, accept, forgive and unconditionally love their community / nation. This can break down when a culture is faced with unexpected challenges, such as Malthusian crises in the pre-industrial era or contact with the West (or rather its manifestations in British gunships and American multinational companies) in the modern era. In the latter case, society typically enthusiastically embraces the trappings of the West and rejects its own traditions, after viewing them from the Western frame of reference. This causes severe internal dislocations, leading to disillusionment and culminating in a vehement rejection of Western values, to an extent impossible in its absense. One can view Bolshevism, Nazism, fascism and radical Islamism as extreme forms of this rejection (and by rejection, implicit acceptance), relying as they do on Western technics in their attempts to recreate an imagined past. The “Western countries” are unique in that somehow or other they have succeeded in substantially imprinting the Idea of the West onto their own traditions. This is much harder than it sounds. The scientific method is alien and unfamiliar to the peasant mind filled with images of rain gods and trickster demons. The rule of law cannot sit well in human societies traditionally reliant on communal coercion, “big man” influence and sacrificial scapegoating. Economic rationalism is anathema to subsistence societies, characterized as they are by reciprocal, socially-determined networks of gifts. Market forces, by destroying this communal spirit, would tear these societies apart, hence the universal disdain for merchants, usury, etc, typical of all rural pre-industrial societies (e.g. see Aristotle discovers the economy, Karl Polanyi). And liberalism (rights for all, including minorities) frequently stands in opposition to democracy (the generally anti-market, conformist will of the people). It is probably no surprise that capitalism and liberalism historically developed most vigorously in the United States, with its abundant high-quality land and scarce labor yielding massive per capita surpluses. The Idea of the West first appeared in the “West” because of the region’s inheritance of Latin (law) and Germanic (customs) traditions, favorable geographic factors (long coastlines, good rivers and fertile, varied climes) and comparatively successful control of population pressures (through fertility suppression – West Europeans married later and had fewer children than most other civilizations, and later outmigration to their colonies). That said, it should be emphasized that even here relations between the West and tradition were uneasy and factitious; as I emphasize again, the Idea of the West is an ideal which humans can only aspire to, but never reach unity with. Having laid out the basic concepts, it is now time to look at two general cases of human socio-spiritual dynamics: Malthusian (what happens to belief systems when a traditional society exceeds the carrying capacity of the land and begins to fall apart?) and Western (what happens to traditional societies when they come into contact with the West?). Both begin at the same place. Hard to comprehend for an individualistic Westerner, perhaps. But this is the way most people lived throughout the eons of human existence. Stadtluft macht frei?? Perhaps Arbeit macht frei isn’t so far off the mark. (Here I would rush to add the caveat that this only applies to communal work where everyone partakes and lacks knowledge of and is too unimaginative to imagine any “better” alternative, such as aristocratic indolence or financial speculation. This is patently not the case in industrial societies and explains the failure of totalitarian attempts to go back to the future). Before the industrial era, all societies were subject to Malthusian dynamics in which population growth saturated the carrying capacity of the land and leveled off at an unstable plateau. The period of high growth was typically regarded as a Golden Age of bucolic virtue (e.g. republican Rome), which I’ve labeled The Rise of Empire. Because of limits to growth, this could not last. Subsistence stress resulted in the growth of cities and large standing armies to soak up the landless poor, and literate bureaucrats to manage the new problems. Paradoxically, even as problems loomed on the horizons many aspects of culture like literacy, inventiveness, etc, flourished. This is because society encouraged its thinkers to “scan” for solutions to these problems. In other words, society begins by rejecting the Idea of the West (in those times, “rule of law” and Greek scientific-rationalism), and the state intensifies efforts to both legitimize itself and coerce people into believing in it. But nonetheless, a breaking point is eventually reached and society loses faith in the state (hitherto, tradition), culminating in the collapse of civilization, a prolonged period of anarchy and reversion to older forms of social existence focused on family, clan and community (denoted as The Collapse of Civilization). During the anarchic period, there is a “radical redefinition of terms” as patriotism (faith in country) goes from being an accepted tradition, to a rejected tradition: for once the Sun dawns over the new Dark Ages, the peasant commune; the manor; self-sufficiency, etc – these are now the new pillars of traditions. Any surviving agents of the state (soldiers turned brigands, renegade tax collectors, the urban intelligentsia, etc) are its enemies. After a few dark centuries, roving bandits seize permanent control of settlements, and become stationary bandits with an interest in development and permanent extraction instead of pillage. Localism, mysticism, anti-statism, etc, once again become heresies. The specter of the state rises anew, rewinding the loop to Year Zero. As attested to by numerous chronicles, first contact with Westerners by less advanced civilizations results in fascination and a determination to catch up, especially to acquire its military-industrial technologies to prevent Western predation. The two cleanest examples of defensive modernizations are seen in Japan during the Tokugawa and Meiji eras, and repeatedly in Russian history (Muscovy under Ivan the Terrible, the Russian Empire under Peter the Great and Alexander II, Stalin, Putin?). Local traditions are seen as incompatible with modernization and are rejected by the ruling elites, often stirring social unrest as the internal balance of power is disturbed. There occurs a growing gap between the Westernizing elites and the more traditional mass of society. The former come to be seen as foreign leeches on indigenous soil, decadent and degenerate; using the rhetoric of Westernization to feed themselves (e.g. see the French-speaking Tsarist aristocracy). This in turn discredits further Westernization, especially once the easiest (and ostensibly most useful) task of military modernization is completed. The people and the elites lose faith in the West: the former because they associate it with degeneracy and corruption (e.g. the Russian workers and peasants most aware of it: because of the development of railway systems, even a peasant from a rural backwater could now comprehend the parasitic decadence of the Court), the latter because of the shallow nationalism consequent from reinvigorated military, economic and cultural strength accruing from limited modernization. There is a gradual movement now back towards tradition (e.g. Slavophilia, the intelligentsia’s idolization of peasant life, etc). But now one of two things happens. A part of the elite realizes that their decadence is politically dangerous (a large gap between the masses and the elites presages revolution), and tries to move back towards indigenous traditions – back to the people, so to speak. This is opposed by another part of the elite that has gotten used to its perks and privileges, despite the spiritual anomie in which they are stuck because of this. The ruling elites become disunited and weak; the masses are increasingly disillusioned with the whole system; new ideologues appear, preaching about total rejection of the West (e.g. the Bolsheviks) and a return to an imagined past of purity and virtue, i.e. to tradition (e.g. the radical Islamists who overthrew the Iranian Shah). There appears a crisis, further straining divisions in the government and polarizing society in general (e.g. World War One). Eventually the government is forced to reform, but alas and alack, as per de Tocqueville the most dangerous moment for a bad government is when it begins to try to get better. By reversing course and showing weakness, it delegitimizes itself in the face of crisis; furthermore, it frequently becomes more democratic just when the people are becoming more hardline, and extremists (Bolsheviks, Islamists, etc) are waiting in the wings. The extremists moderate their positions to win over the people and consolidate their control; after that they unleash terror, taking the country into the far-top fringes of uncompromising rejection of the West. This is the dark region where totalitarianisms rise and democides are unleashed. On the other hand, if the elite remains united; if the crisis is not very severe; if the people retain a firm belief in the Idea of the West and are unswayed by the extremists, then a more moderate outcome can be expected – a reversion back to the past, the state of stasis, yet having assimilated some elements of the Idea of the West during its loop so now “better” and perhaps “fairer” than before (at least by the standards of more Westernized states). They remain in this comatose state until another shock (e.g. defeat in war by a more Westernized nation, or recognition of weakness) forced them to act, restarting the loop. Why do I call this a Sisyphean loop? Because while it lasts this basically explains a tortured nation’s attempts to catch up with “the West” (roll the rock to the top of the mountain), but never managing it (the rock keeps going back downhill). This is very pronounced in Russia – it’s entire history since gunpowder Muscovy has been one of quixotic attempts to catch up to and surpass the West, yet which all too often ended in catastrophes wrought of messianic delusions, and prolonged periods of stagnation, decline and frustration. I will explore its dynamics more closely in an upcoming post, focusing on a) the continuous “radical redefining of terms” that characterized Soviet history from 1914 to 1953, b) the belief dynamics of the post-1988 transition and c) its prospects for the future: sovereign democratization (the “Putin Plan” – democratization / Westernization on its own terms / while retaining belief in tradition), return to authoritarian stasis (Russia’s “natural state”, in both meanings of the term), totalitarianism or liberalization? Yet this is not specific to Russia, it’s just that the overall dynamic is most visible there. 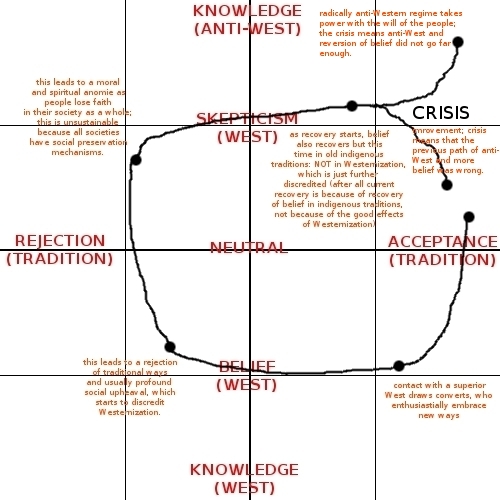 Even nominally “Western nations” like the US – that archetype of the West – is imprisoned within the Sisyphean loop. 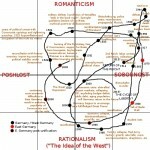 It’s just that through the accumulated circular momentum of liberal tradition, the structure of its political system that moderates sharp swings towards extremism in the population and of the media which muffles extremist voices, and most importantly its reconciliation of liberalism with popular democracy, its “liberty loops” manage to remain anchored firmly within the bottom-right quadrant, well away from the instability brought on by the disillusionment / rejection of tradition of the left, and the totalitarianism of the top. But what makes the US a spiritually much more satisfied nation is that the very organic nature of the integration of its sobornost and Westernism makes Americans unaware that they life in the Belief Matrix, just like everyone else. Why do I call it a matrix? a) because it is a matrix / grid, and b) in honor of the films, of course – whereas people believe they have free will, in reality all choices are predetermined and our only task is to try to understand and accept why we made those choices (in itself a Sisyphean-like endeavor – so yes, don’t bother pointing it out, I know I’m in the Matrix too). Law of Skewed Perspectives – ideologically skewed people have warped perspectives on other people, interpreting moderates as biased; and those slightly biased, as irrevocably so. If political leaders are sufficiently out of sync, then the people are radicalized in the other direction. Law of Quantum Truth – any individual finds it hard to judge the position of another, including herself; this is best done by a large number of individual, informed observations which tend to build a probability map around the likely position. Malevolent ideological opponents would represent the extreme edges of that probability map as that individual’s true position, whereas in fact it is not (or at least very rarely so). Law of Circularity – at its extremes, ideologies converge (or flip). For instance, shout very loudly that you are a zealot for progress, justice, freedom, etc, even as your actions forsake those ideals. Examples: Bolsheviks, neocons, liberasts. Law of Extremism – they tend to flip if they do, but they need to be in separate enclaves to build up into really extremist movements. Violent revolutions tend to happen during agrarian-industrial transitions because you have lots of self-contained classes thinking similarly and very opposed to each other (e.g. urban proletariat, the bourgeoisie, the aristocracy, etc); these differences tend to become less extreme in the later stages of industrialism when there is greater social mobility. Radical Redefinition of Terms – how traditions are defined, and hence whom the community accepts and whom it rejects. A good illustration is the Russian Revolution: Bolsheviks came from being viewed as traitorous outcasts in 1914, to heroic defenders of the Motherland by 1918 against the foreign-backed Whites – who had themselves become heretics. During the 1930’s, the Party turned on itself and consigned many Old Bolshevik stalwarts into oblivion. Severe shocks can lead to a RRoT from below, while totalitarian regimes can perform RRoT’s from above. Law of Chaos – big, sudden changes lead to instability, chaos, unpredictability, e.g. after radical redefinition of terms. Law of Distance and Antipathy – the more distant you are from a certain viewpoint, the more you hate them. Hence the reason moderates are moderates, and extremists are not. Law of Social Development – agrarian (collective belief → stability, rigidity, conservatism, but catastrophic breakdown if system fails); industrial (less collective, more skeptical, but still similar); post-industrial (atomized, enclave concentrations, very skeptical). Law of Heresy – the totalitarian mind, in its rejection of the West and fervent rediscovery of traditional belief, views all deviations from orthodoxy as heresy (see Law of Skewed Perspectives, which applies to ideologues). As commentators Scowspi and Kolya in the Categorizing the Russia Debate discussion noted, true artists are by definition dissidents (at least in the opinion of other dissident artists 😉 ), hence they find life tough in totalitarian societies and may themselves become extreme in their dissidence. The concept of heresy is alien only to someone who completely internalizes the Idea of the West (this is of course impossible in practice). We live in a very, very interesting time. I’m sure the next few decades will be far more fun than even the first half of the twentieth century in Europe, though whether this is a good thing is an entirely different question. 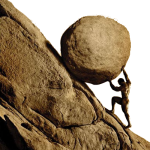 1) The Sisyphean Loop will remain as strong as ever as societies try to reconcile their traditions with the West and to internalize the paradox that is liberal democracy. 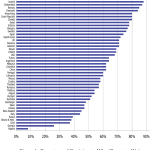 Whereas there have been some major discontinuities this century, the dominant trend is that the power of liberal democracy is taking sway throughout the entire world – if not in reality, at least as an ideal. Practically all nations, except a few in the tortured Dar al-Islam (where Islamism constitutes a major alternative, albeit discredited by rational people), accept liberal democracy as the optimal form of government, much as Fukuyama observed in his “end of history” thesis”. 3) Perhaps not for long though. The Malthusian belief cycle is reasserting itself in the shadows of industrial civilization – the polluted, drying rivers; the depleting oil fields; the melting permafrost releasing Siberian methane into the atmosphere; failed states and spreading chaos; the democratization of the means of making terror from the state to the individual. 4) Right now, I would say the world as a whole turned a corner with the 2008 Crisis (a much less noticed, but in reality more significant thing about that date is that it was most likely the year of peak oil production). “Scanning” was much in progress during the 1970’s-2000’s (clean energy, “sustainable development”, etc), when energy and ecological problems first made themselves felt. I think the 2010’s will see a heightened period of chaos, governments everywhere will become more authoritarian and new colonial empires will emerge. “Scanning” will within one to two decades be suppressed and confined within certain parameters as governments begin to chronically fear instability and collapse, fear that nothing they can do will save their societies from collapse. (They are already preparing: note the proliferation of CCTV cameras, databases, militarized security forces, etc). Quite possibly questioning the health and desirability of industrial civilization will come to be classed as subversive, perhaps under the rubric of the war against terror.